It’s bloody and brutal with plenty of sweeping combat, but God of War III feels a little unpolished and a lot like too many other games. It’s almost impossible for any God of War-type game to distinguish itself — even God of War III. The first game’s formula, featuring hordes of enemies and weapons swinging in all directions, has been copied so much (and sometimes so well) that it has pushed the designers of God of War III to try a change of scale rather than style. 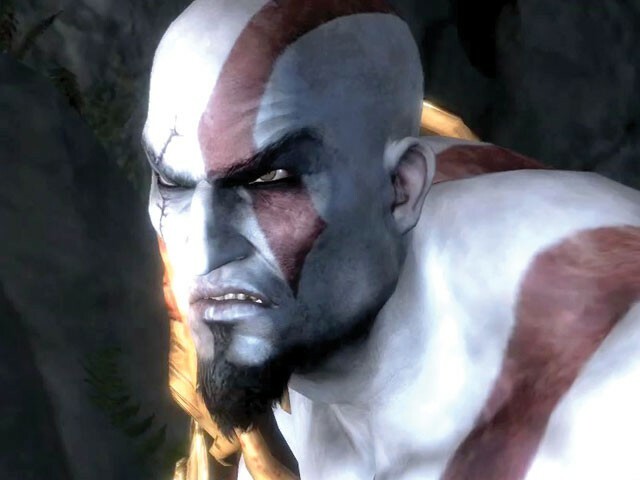 Now, Kratos — the angry mortal hero on a mission to destroy the gods — is lost in ever-larger environments, to the point that he often becomes a dot in the landscape. In the background, the peaks of Mount Olympus and the cliffs of the Underworld glow like dioramas lit with colored Christmas lights. In these settings, Kratos resembles a plastic figurine, clinging to walls as if he had been glued on. Sometimes he even hovers slightly above the ground as though he were being held by an invisible hand. Among the combatants, everyone tends towards the same stony grays coated in shiny gloss, making the enemies hard to distinguish from the ground and from each other. This often makes Kratos’ rolling and whirling combat a matter of random thumbstick swiveling. Nevertheless, Kratos instantly turns his weaponry in whatever direction I desire without any of the slippery gliding around of other games. The enemies are formidable when ganged up together, which is a staple of this genre. But alone, they can be imposingly stupid. I played matador with minotaurs and saw centaurs get baffled by corners, stamping their hooves while I lashed their backs with the claws of Hades. And the giant boss battles — usually fought against towering torsos that emerge from the ground — were most often fought by accurately executing patterns of dodges and attacks until either the beast or I expired from exhaustion. THE GOOD: God of War III is drenched in plenty of gore, though most of it looks like globules from a lava lamp and none of it sticks around to stain the ground for very long. But I enjoyed hoisting enemies overhead and tearing them in two. (I even yanked out the eye of a cyclops and got drenched in the ensuing spew.) Even some of the cinematic violence satisfies, such as watching a titan pluck Helios’ fiery chariot from the sky and fling it against a mountainside with a bright splat. Lest that seem too passive, I later tracked down the sun god and ripped off his head (replete with plastic-looking skin and molded Ken-doll hair). THE BAD: Bad camera placement has plagued many third-person-perspective games, and God of War III is no exception. Since I can’t control the placement, aim or motion of the camera, I’m stuck accepting the viewpoint it gives me, which often places enemies outside of my field of view, leaves me looking like a speck in the distance or leads me to leap off cliffs. I understand that the controller’s buttons and thumbsticks are required for combat, but the opportunity to adjust the camera would have been helpful, oh, almost all the time. THE BOTTOM LINE: It’s bloody and brutal with plenty of sweeping combat, but God of War III feels a little unpolished and a lot like too many other games.